Watch An Exclusive Promo for I Spit On Your G.. The Final Trailer Revealed for I Spit On Your..
ShockTillyouDrop.com has been provided an exclusive first look at the third trailer for I Spit On Your Grave 2, which Anchor Bay is bringing to DVD and Blu-ray on September 24th. This latest preview, once again, shows that some very bad things are about to be done to some very bad men. Head inside for a look at Anchor Bay’s official DVD and Blu-ray cover art for I Spit On Your Grave 2, arriving September 24th. Akin to the remake’s key art, this one adopts a black and white representation of its protagonist. After the jump, you’ll find the latest trailer for I Spit On Your Grave 2. The film stars newcomer Jemma Dallender as Katie, a young woman, trying to make it in the cutthroat world of modeling in New York. A new image has been revealed from the fall release I Spit On Your Grave 2, once again directed by Steven R. Monroe. You can find it after the jump. Two Anchor Bay titles presented their trailers during Comic-Con this week. The first is Nothing Left to Fear – the first horror film to be produced by Slash – and the second is I Spit On Your Grave 2. Anne Heche, Clancy Brown and James Tupper star in the former, a supernatural thriller arriving October 8th. The latter, more of a teaser than anything, previews the sequel to the 2010 film. Anchor Bay has set a September 24th release date. 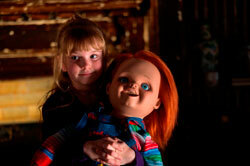 Film4 FrightFest 2013, returning for its 4teenth year, is delighted to unveil its biggest line-up in history.